When it comes to identifying and branding our consumer values, what is most important to us? Reliability, looks, cool factor or could it be something more human and altruistic? In tough economic times, the criteria for making such decisions is in constant flux. In days of yore — think pre-2005 — retailers fired a salvo of price cuts on the Friday after Thanksgiving and shoppers raced to spend billions on holiday gifts. The day was originally nicknamed Black Friday by police officers who dreaded the traffic jams, bumper thumping and misdemeanors that arise when so many people converge on shopping districts and malls. Eventually the term came to describe the start of the period when retailers see profits for the year and a kind of retail gluttony so divorced from the true spirit of the season that it made all but the most benumbed consumers feel conflicted, if not ashamed, of the excess. Then came the Great Recession. 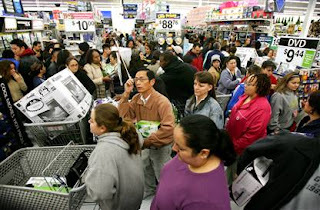 In 2008, we saw the weakest holiday sales since 1973. Gift buying was more like a marathon than a sprint, as people shopped the sales that began in October, applying a sober sense of how, when and why to buy. The change actually began before the housing bubble burst, Wall Street collapsed and unemployment soared. Beginning in 2005, the quarterly surveys we conduct showed a shift in attitudes. Like rabbits that run before humans feel an earthquake, consumers sensed the approach of the economic crisis and began to prepare by saving more and spending less. More important, they began to express different kinds of values as they shopped. Brands regarded as exclusive, arrogant, daring or trendy began to suffer severe declines in popularity, while those associated with quality, reliability and durability rose. Experts have long understood that as we head to the marketplace to satisfy our wants and needs, we also pursue some unstated and often subconscious agendas. On a narcissistic level, we want to show the world we are smart, beautiful, powerful, wealthy, you name it. However, we also vote with our dollars for certain social and political ideals. In this way we reward producers, retailers and service providers who meet our definition of "good." Lately this aspect of shopping has come to the fore, as people look for ways to exert their influence on the social landscape and ease their frustrations about problems that seem gridlocked by politics. The biggest swing, when it comes to the issues we confront with our dollars, is related to civility. Starting in the middle of this decade, respondents began to tell us that they wanted to feel respected and appreciated by the people they do business with. Between 2005 and 2009, the value placed on the "kindness and empathy" expressed by vendors shot up a whopping 391%. The importance of "friendliness" went up by 124%, and the value placed on "social responsibility," which can be translated as "being a good neighbor and citizen," rose by 63%. In commercial terms, all of this is good news for manufacturers that stress service and for proprietors who see every sale as a chance to build a long-term relationship with a customer. This is why Zappos' shoppers remained loyal even when it shifted away from heavy discounts. They are so happy with the attention they get when they contact the company's call center in Las Vegas that they are fine with paying full price for shoes. With a solid majority telling us they'll pay a little more for durable quality, companies such as L.L. Bean, Levi Strauss and Red Wing Shoe can expect healthy sales even on higher-end items. The same is true for artisan-made items sold on the Internet by services such as Etsy, which connects individual artists and craftspeople from around the world with a global pool of customers. Conservatives, moderates and liberals alike prefer to give their dollars to companies that invest time and money in local communities and are respectful of the environment. Though they may disagree on an issue like carbon emissions cap-and-trade, American shoppers generally prefer energy efficiency, eco-friendly packaging and sustainable production. Wal-Mart, a bellwether for retail trends, has signaled the rise of these values as it has reduced packaging and stocked more compact fluorescent bulbs as well as locally produced organic foods. People reward Wal-Mart and others because they believe that by voting with their dollars, they can actually change the world. Indeed, two-thirds of the people we survey believe that "my friends and I can change corporate behavior by supporting companies that do the right thing." Even those people who are skeptical about the effect they can have with their spending habits go out of their way to patronize companies "whose values are similar to my own." We call the changes in the marketplace a "spend shift," and our recent tour of businesses across the nation and the data we have collected suggest that the shift has staying power. By big majorities, people say that they are more frugal than they used to be and that the economic crisis has had a long-term effect on the way they spend their time and money. The biggest point of agreement? More than three-quarters say that "how many possessions I have does not have much to do with how happy I am." The trends augur well for businesses that heed public sentiment and give people what they want. They're more consistent with the true values of the season too. Instead of Black Friday hysteria, the consumers we talked to are making more deliberate choices and seeking out retailers who demonstrate kindness, respect, honesty and concern for others. For our society, the trend suggests more modest but happier holidays to come. Coauthors of the new book "Spend Shift," Michael D'Antonio is a New York-based writer and John Gerzema is president of Brand Asset Consulting, which conducts the surveys that provide the data they cite.